In between sunny summers and icy winters, the Mammoth Lakes region is aglow with warm autumn colors, making it the perfect place to frolic this fall. 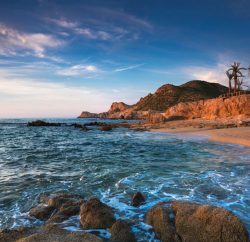 In Southern California, we’re fortunate to have sunshine year-round. Even when the temperatures drop (you know, to a frigid 50 degrees) the palm trees continue to sway in the wind, keeping their viridescent fronds throughout the winter season. With a lack of real seasonal weather, sometimes it’s nice to escape to an area where the fiery leaves of fall reign supreme, lighting up the hillsides with their vibrant hues. 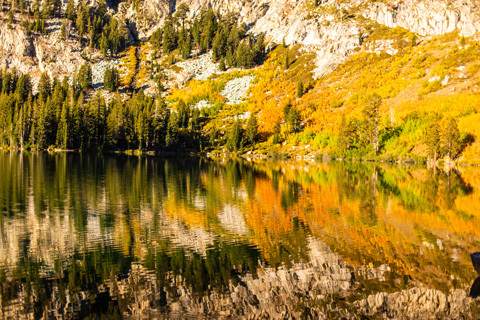 A mere 300 miles away, Mammoth Lakes, Calif., and the surrounding Sierra Nevada offer stunning fall scenery amidst a great number of alpine lakes, hiking trails and jagged peaks. Before the area is blanketed in fresh layers of snow, head north and take advantage of the colorful landscapes. To cut down on your travel time and avoid a risky drive (snowstorms can occur nearly any month of the year in the Sierra Nevada), consider flying into the Mammoth Yosemite Airport, a small hub with only one gate. While Alaska Airlines currently services the region, that’s about to change as United Airlines steps in to take over daily, year-round flights to and from Los Angeles on Dec. 1. No matter how you arrive, be sure to pack a jacket and some hiking boots. 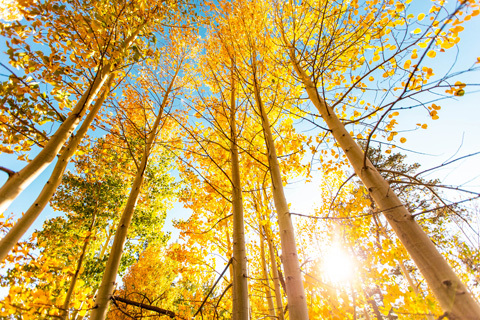 Color starts to spread around mid-September and reaches its peak in October or November, taking over the quaking aspen, willow and cottonwood trees in the area. 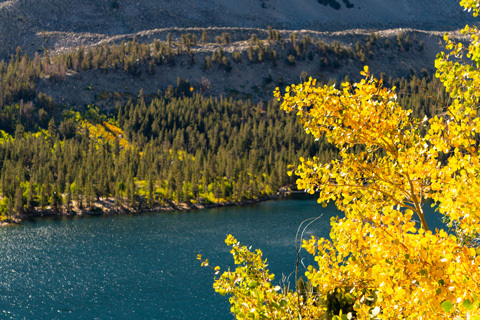 Read on to discover some of the best places near Mammoth Lakes to spot fall foliage. Start in the south and work your way north, moving in the same direction the leaves typically change. Situated between Mammoth Lakes and the small town of Bishop, this 20-mile valley holds appeal for locals and visitors alike, no matter the season. In the spring and summer, wildflowers blossom while winter is the perfect time for snowmobiling and cross-country skiing. But, during the fall, this is one of the most colorful spots around, with bright, blazing leaves illuminating the many trails. Drive 9 miles into the canyon and you’ll reach a parking lot at the end of the paved road. From here, hit the Little Lakes Valley Trail, which winds through upper Rock Creek Canyon. With dramatic peaks rising all around and trickling creeks connecting the many lakes—Mack, Marsh, Heart, Box, Long, Gem and Chickenfoot lakes are all nestled in the canyon—it’s one of the best places to hike in the area. 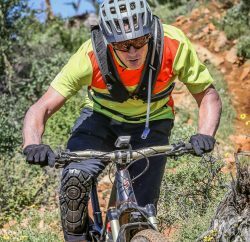 Aside from hiking, adventurous guests may take advantage of fishing through mid-November as well as mountain biking and horseback riding. 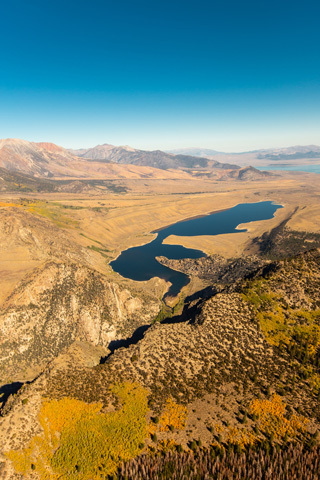 Most lakes that you can drive to lack the impressive appeal of those nestled away behind hills and peaks, but Convict Lake is different. Commonly considered one of the most beautiful alpine ponds around, the clear water pools below rugged mountains, originally carved out of the land by the area’s extensive glaciers. During the fall, much of the color can be seen during the drive up, but you might find the leaves changing near the water as well. 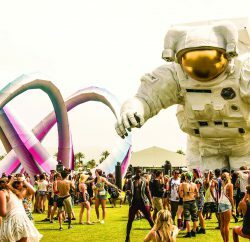 This easy-to-get-to space offers plenty for outdoor enthusiasts to enjoy. For those who can’t handle elevation gain, this lake—at only 7,850 feet above sea level—is a wonderful place for a walk; simply drive up and take a turn around the 3-mile trail that encircles the lake. The area is also a favorite amongst photographers in the autumn months. 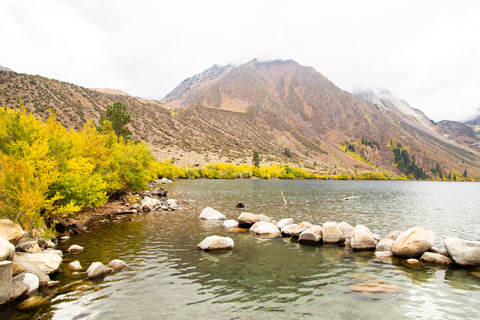 Fishing is another popular pastime in the fall, when locals and visitors flock to Convict Lake to catch both rainbow and brown trout during the Ambush at the Lake fishing derby, which takes place weekly on Fridays through Nov. 9. Those staying within the Mammoth Lakes community are already in close proximity to the lakes basin, which lies just minutes away in the hills above town. This area has so much to explore that you’re bound to find colorful fall leaves at some point. The five main lakes include Twin Lakes, Lake Mary, Lake Mamie, Lake George and Horseshoe Lake, but there are plenty of others hidden in the nearby hills. Near the largest of the five, Lake Mary, a trailhead at Coldwater Campground takes visitors out to Heart Lake, arguably the greatest spot to view fall foliage in this basin. Spots like Lake Mary and Lake George are also big enough for motor boating while Lake Mamie offers rowboat rentals. It’s also possible to kayak or stand-up paddleboard on any of these lakes in the fall, giving visitors a chance to get out on the water and see the color changes from a different perspective. Continuing north on U.S. Route 395, you’ll soon run into June Lake Junction, the turn-off point for a loop of roadway that offers plenty of fiery fall color. The stunning displays of oranges and yellows tend to start a little later here so those visiting later in the season can watch as the hues spread. Take in color near June Lake, the loop’s eponymous body of water, where guests can also visit the nearby town for a drink. June Lake Brewing offers chances to sip cold beer year-round—except for one week in November when the establishment closes for a staff retreat—with outdoor spaces so you can enjoy your drink with views of fall leaves. Head on past Gull Lake to Silver Lake, where an endless array of aspen trees mean golden leaves will be fluttering all around. Those visiting during early fall may be able to stop for a bite at Silver Lake Cafe, a quaint spot with a vast menu of hearty burgers and sandwiches to enjoy while admiring the leaves outside the windows. Toward the end of the loop, before you wrap back around to U.S. Route 395, you’ll pass by Grant Lake, though the color tends to be less vibrant here. Another option is to take part in the beloved Eastern Sierra tradition of road cycling, completing the June Lake Loop in the fresh air to fully enjoy all of the colors that abound. Another place filled with quaking aspens is Lundy Canyon, a long and laid-back ravine with plenty of beauty to offer. Simply driving past the lake and the accompanying colorful groves will give you a feel for the color in the area, but hikers especially will enjoy the canyon. The trailhead starts in one of the groves but soon ascends, giving travelers sweeping views of the sea of vibrant yellow leaves below. Another highlight of this hike is the nearby waterfall, which trickles over an expansive set of rocks as fall foliage bursts all around.